A close up of flowers in full bloom are seen in Garden Bouquet II floral tapestry. Here in this wall hanging we see blooms in white, pink, crimson and blue. Filled with floral detail, this is a companion piece to Garden Bouquet I. 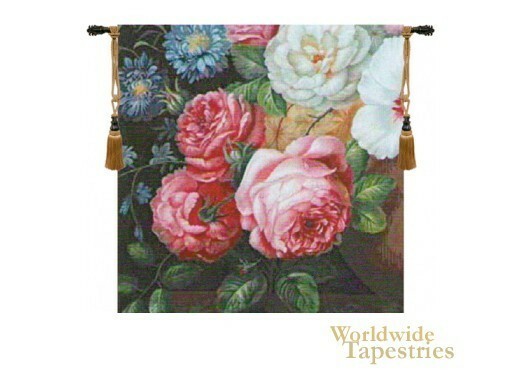 This French floral tapestry "Garden Bouquet II" is backed with a lining and has a tunnel for easy hanging. Note: tapestry rod, where pictured, are not included in the price.